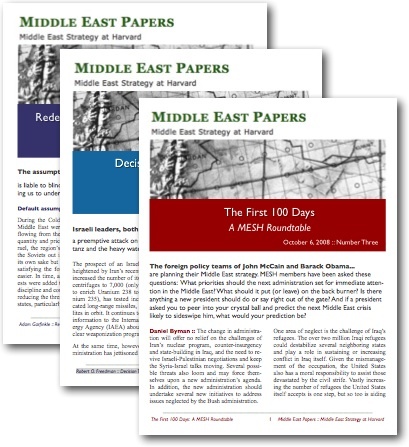 Middle East Papers is a series of occasional studies published by Middle East Strategy at Harvard (MESH) and distributed exclusively in electronic form. The series complements the MESH weblog, and provides a format for longer contributions by MESH members and other analysts. Contact MESH to inquire about manuscript submissions. Walter Laqueur, Disraelia: A Counterfactual History, 1848-2008, April 1, 2008. What if mass Jewish immigration to Ottoman Palestine had begun decades earlier, and put two million Jews in the land by the mid-nineteenth century? Walter Laqueur, author of a major history of Zionism, plays with chronology to ask a deeper question about the double standards that plague the debate over contemporary Israel. Philip Carl Salzman, Politics and Change among the Baluch in Iran, June 20, 2008. In recent years, the Baluch of southeastern Iran have identified increasingly with Islam. But far from implying the weakening of ethno-tribal identity, this “Islamic intensification” actually signifies its resilience. Philip Carl Salzman argues that the swing to Islam is a new iteration of segmentary opposition, which is the distinguishing feature of Baluchi social organization. The First 100 Days: A MESH Roundtable, October 6, 2008. Fourteen members of MESH offer admonitions and advice on the Middle East to the next U.S. president. Adam Garfinkle, Redefining U.S. Interests in the Middle East, October 9, 2008. The conventional recital of U.S. interests in the Middle East hasn’t changed since the end of the Cold War. But the protection of oil, Israel, and American primacy in the Middle East must be reconfigured in the absence of a great power rival. Adam Garfinkle proposes a redefinition of interests for a new era. Robert O. Freedman, Decision Time for Israel on Iran?, April 21, 2009. As Iran’s nuclear drive continues unimpeded, and the Obama administration pursues a policy of “engagement,” Israel approaches a moment of decision. Robert O. Freedman explains why diplomacy and sanctions are unlikely to succeed, and considers plausible scenarios of an Israeli resort to military action against Iran’s nuclear facilities. Walter Laqueur, Russia’s Muslim Strategy, November 1, 2009. Russia vacillates between resentment of the American-led world order and fear of an ascendant Islam. For now, it is the resentment against the West that dominates the Russian outlook, resulting in a makeshift approach to Islam at home and abroad that may prove inadequate as Russia’s own Muslim minorities and neighboring Muslim states grow stronger. Martin Kramer, How Not to Fix the Middle East, December 7, 2009. The Obama administration is undercutting its own ambitious agenda, by signaling that the United States has lost some of its weight in world affairs. The “post-American” rhetoric of liberal internationalists and realists is setting off a scramble for advantage among the “middle powers” of the Middle East. Mark N. Katz, Obama’s Approach to Russian and Iran, December 14, 2009. A journalist has described Obama’s approach to foreign policy as “applying the same tools to international diplomacy that he once used as a community organizer on Chicago’s South Side.” But these tools are likely to be ineffective in influencing Iran’s nuclear drive and Russia’s willingness to cooperate with the United States to stop it.